You can break your course into groups for projects or focused discussion on topics. Then, return to Discussions to establish your group assignment and the group forums. Create a Category for each group assignment. To do so, go to Manage >> Manage Categories >> Click on Add, and add the title of the assignment, points, and check ‘Send to gradebook’. 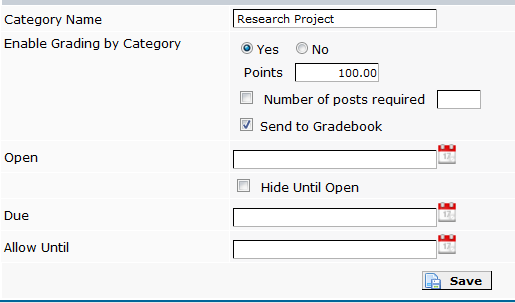 If you will require your students to contribute a minimum number of posts, you can specify this in this screen. Leave the dates out. You will set them at the forum level. Click on Save. Next, create a forum per group for this assignment. Go to Manage >> Manage Forums > and click on Add. Title the forum in a way that it identifies what group and assignment it is for. Assign it to the right category! Optional: ​In the “Description” field of the forum, you may describe the break-down of the group’s membership (i.e. A – E, F – K, etc.) to help students see who is in their group. Alternatively, you can ask students to start a thread introducing each other to their peers, and breaking up the roles and responsibilities for the project. Set the open and due dates (and allow until dates, if you will offer a grace period). Scroll down, and under “Access”, select “Allow Access to Selected Groups”, and check the group that should have access to this forum. Below the group access, you may allow ‘read-only’ access to the group forum to the rest of the class, immediately or after the due date. This way, other students can view (but not reply to) what other groups are doing, see how other groups are working together, and learn from others’ research and processes. Repeat steps 2 – 6 to create a private forum for every group for your assignment. The above example will look like the following in Discussion Home. The title of the category (title of assignment) is what will be listed in the gradebook. Repeat steps 1 – 7 for every group assignment. To grade the assignment, you will click on Grade Category. Suppose an English instructor has several sections merged into one course site (i.e. the rosters from all of them get uploaded into the site). To keep discussions private by section, you may assign forums to specific sections. Sections are the same as groups with more metadata (from A&R). When creating forums, if you have more than one section loaded into your site, you will see the section numbers/id’s under “Allow Access to Selected Groups.” This way, you can specify that a forum be accessible to a specific section only. See examples in the following screen shot. If you teach more than one section in a site, to keep the dialogue manageable and separate, create one category (and forums) per section. Notice that the last category is set to allow access to ‘all site participants’. Students from ALL sections will be able to post general questions in one forum. A common Student Lounge is also set up for all students in the above example. You can create groups and forums to keep communication private for a specific group of users in your site. For example, you could create a group called “Instructional Team” in which you add all the Teaching Assistants in it. Then, you can create a forum that is accessible just to the Instructional Team to share privately how to handle things in the class. Instructors need not be added into groups as instructor roles have access to all groups, by default.